I think we can all agree that I am not a domestic goddess. I would like to be a woman who can clean and cook and make holiday decorations out of a used milk carton and a couple of pipe cleaners, but the reality is that my talents lie in other arenas (I'm not sure exactly which arenas those are, but I must have some talents...right?). 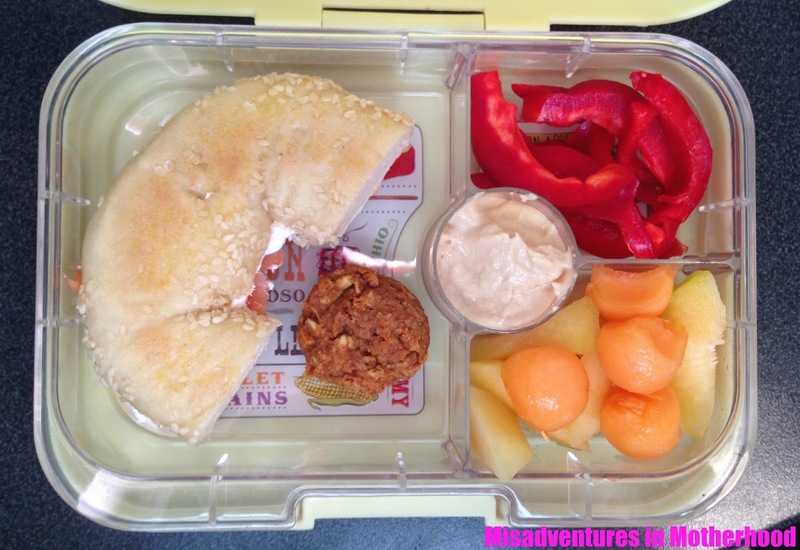 It surprised me, therefore, that I enjoy packing a lunch for the Muffin Man every day. I know, it's shocking, especially since the last thing I "cooked" was a vodka martini with extra olives. I admit that the idea of packing a lunch initially stressed me out. Before school even started my anxiety about having to prepare a delicious lunch that my kid would actually eat led me down a Pinterest black hole in which I found myself pinning images of flower-shaped lunch meats and bananas sculpted to look like characters from Frozen. If you are creative enough to sculpt Disney characters out of produce, I salute you, but for those of us living in the real world - the ones who have all of five minutes to throw something together during the morning rush - I prefer a more practical approach to packing lunches. Leftovers are your lunch time friend. 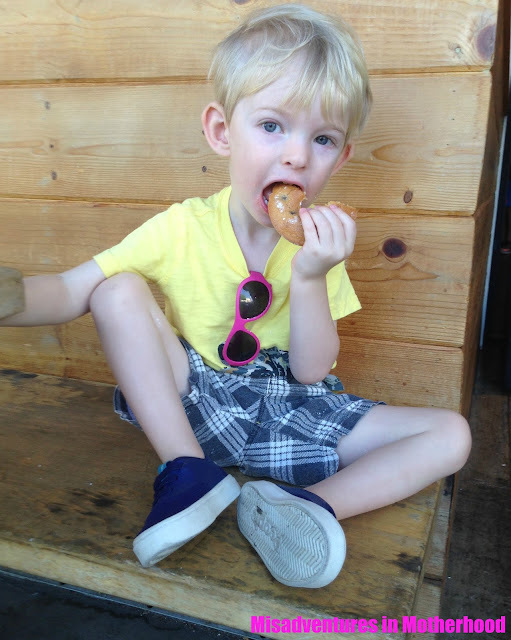 Whatever my kid doesn't eat for dinner is destined for his lunch the following day. Obviously, this rule doesn't hold if he didn't like what we had for dinner and he refused to eat it, but we do our best to prepare something he will eat at every meal. I'm not above subterfuge. Getting Noah to eat protein, especially meat, is a major challenge. He used to eat everything, but his current preferred diet includes cheese and bread and bread and cheese. Since I know he'll always eat a grilled cheese, I sneak in some shredded chicken and he's none the wiser. Play favorites. If your kids will eat it, put it in their lunch. I don't particularly like to eat the same thing every day, but Noah would be happy to eat bagels with cream cheese for every meal. I've found that when I include at least one thing Noah really loves, he's more willing to try something new. Wow Butter wins. Noah's preschool is peanut-free, but most of the schools here in the city of concrete and broken dreams are completely nut free. Wow Butter is made from toasted soy, so it's school approved. It also happens to be totally delicious. 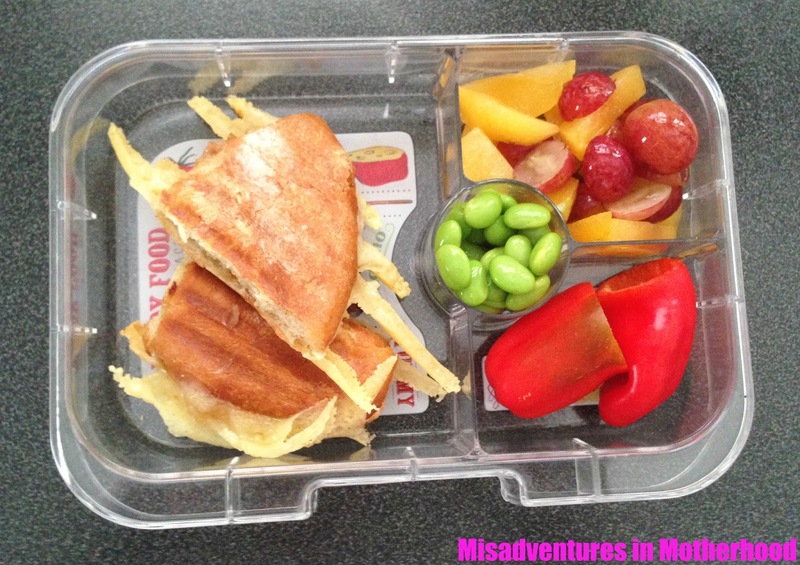 It's a fantastic way to get your kid to eat protein without endangering the lives of the kids with nut allergies. Don't despair. Honestly, not every lunch is a win. Sometimes, Noah is just too excited to play with his friends to sit down and focus on eating. I've found that if I offer him the rest of his lunch to eat in the car on the way home, he often finishes whatever is left. If all else fails, remind yourself that it's not how much your kid eats in a day, but how much he consumes in a week; then pour yourself a glass of wine and toast your lunchtime efforts. 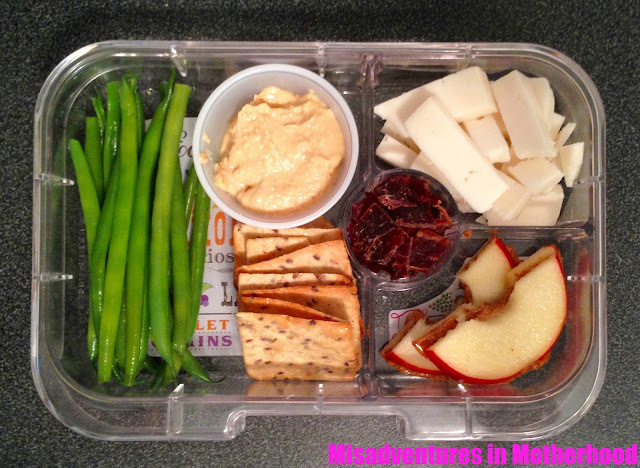 Blanched green beans (leftover from dinner), Trader Joe's organic hummus, Food Should Taste Good rice crackers, Lucky Cow teriyaki jerky, goat cheese, apple and almond butter crescents. 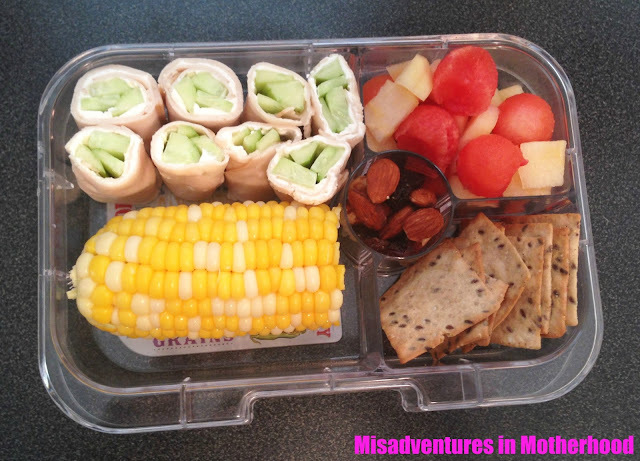 Weelicious turkey & cucumber roll-ups, corn on the cob (leftover from dinner), Food Should Taste Good rice crackers, trail mix, watermelon balls & Asian pear. 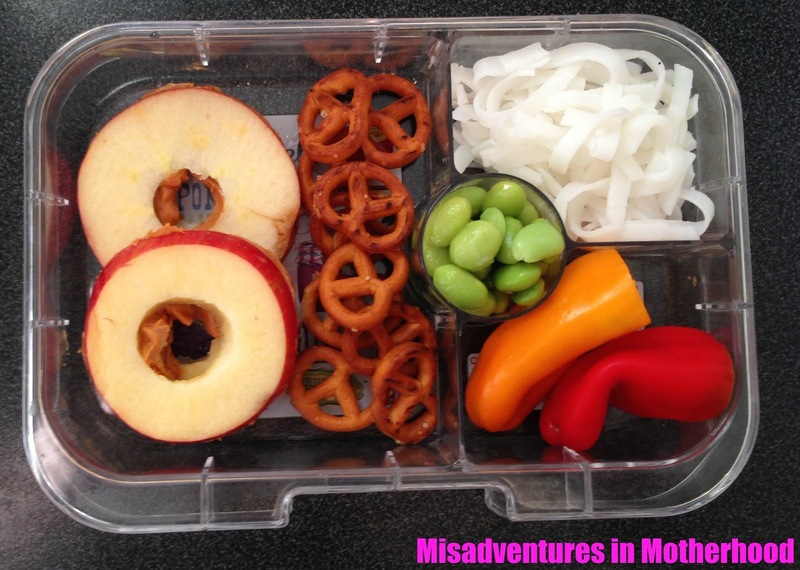 Apple and Wow Butter "sandwiches", Trader Joe's gluten free pretzels, edamame, Pad Thai noodles (leftover from dinner), sweet baby peppers. I'd show you a picture of what I ate for lunch yesterday, but the crusts of bread and half-chewed meatball I snagged from Rose's highchair weren't all that photogenic.